We host a major National Rally annually, always in a different location around Australia. This event sees members come together for an exciting eight day event. A rally programme boasts so many exciting events and activities, it's no surprise that members love coming along. Our rallies feature a range of special interest events, information seminars, entertainment, exhibits and trade shows, local sight-seeing tours, disc bowls competition, craft sessions and dance lessons. Attending one of our rallies is sure to keep you on your toes. If you haven’t been to a rally before, you can find all you need to know here! Read the Rally Rules here. Preparations are well underway for the 34th National Rally to be held 20 -27 October 2019 at Elmore Events Centre, Rosaia Rd, Elmore VIC. There are plenty of powered sites available. Have you thought about volunteering? Please click here for volunteer form. The Rally Ball theme is 'Down on the Farm' and will be held on Friday 25 October 2019 in the main pavilion from 7:00 pm. So polish up your boot-scooting skills and have plenty of fun. Start checking out the op shops now for some quirky farm related outfits. To encourage everyone to have a go, there are two sections - open and novice. Novice entries will be from photographers who have not yet won a photography prize at a national rally. Members can choose from all entries to vote for the 'People's Choice' winner. Click HERE for an entry form! A special day in support of the McGrath Foundation! Pink up your vehicle, work area and outfit. 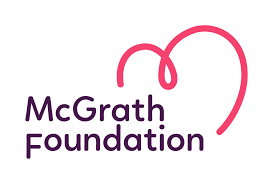 All donations going to the McGrath Foundation. Are you one of those people who is always finding better ways to do things? Then this rally is your opportunity to share those ideas! As part of the Workshops program, we are inviting all members to present their personal innovation. The idea should be one that improves our RV lifestyle in some way by making it safer, easier, more efficient or sustainable or more technologically connected. There will be a prize awarded for the innovation most popular with members. Join us on Facebook for all the latest rally news and information! Are you looking to trade at the upcoming rally?